You can now make a contribution through a mobile app! 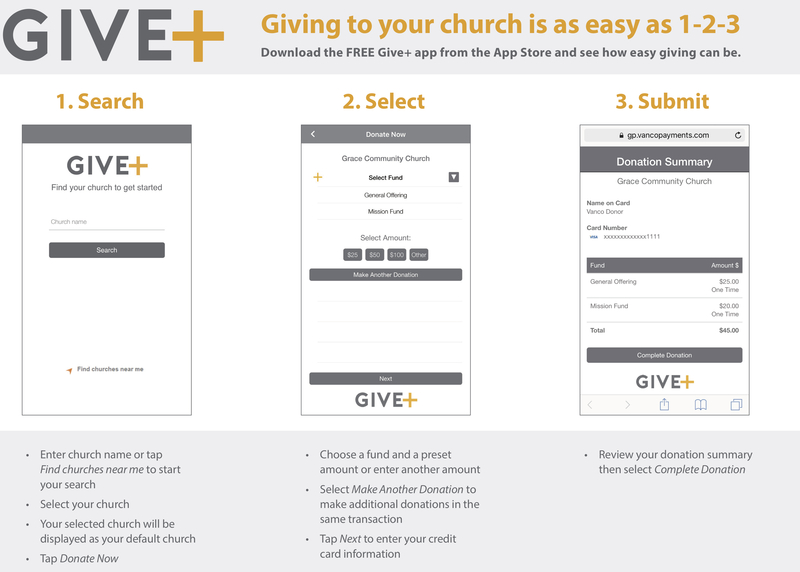 If you have an iPhone or Android, you can download Give+ Church for free from the App Store. Simply search for “give plus church” to quickly find and start using the app. It’s easy to make one-time or recurring donations to multiple funds with your credit or debit card. Simply send a text to 952-260-5721 with the amount you would like to contribute. Choose your dollar amount ($3 minimum) along with the word for which fund you want that contribution to go towards (If no word is entered your gift will be applied to the general fund). Within a few moments, you’ll be sent a text with a link to register. Click on the link and enter your cardholder name and credit or debit card information. (Note: for the expiration date no slash is needed. Example: Nov 2017 would be entered 1117). Once your registration is complete, you will receive a text verification and a receipt via email. For future giving, simply send a text with the amount and word you wish to give, and it will process automatically! It’s as simple as that. Throughout the year we will introduce other words your text giving can support. Edit or #Edit - Allows a donor to edit name, payment method, address and email. Once the edit keyword is sent, the donor will receive a link. Funds or #Funds - Donors can send this message to receive a list of Immanuel’s current Give+Text funds.